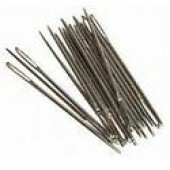 Chenille needles have a large eye and a sharp point and are used in the art of crewel embroidery and ribbon embroidery. Sizes range from 13 to 26; the most popular sizes are 16 to 26. Sizes 13 and 14 are commonly used for heavy and coarse fabrics.